Krabbe’s disease is an inherited disorder that affects the nerves of the nervous system. It affects about 1 in 100,000 people and affects most babies. It is caused by the malfunctioning of an enzyme that causes damage to the myelin sheath. Krabbe’s disease, what is it? Krabbe’s disease is an inherited disorder that destroys the sheath that surrounds the nerve cells (myelin) of the central nervous system (brain and spinal cord) and peripheral. In most cases, the signs and symptoms of Krabbe’s disease develop in babies before the age of 6 months, usually resulting in death at 2 years of age. When it develops in older children and adults, the course of the disease can vary considerably. There is no cure for Krabbe’s disease, and the treatment focuses on supportive care. However, stem cell transplantation methods have shown some success in infants who are treated before the onset of symptoms and in some older children and adults. Krabbe disease affects about 1 in 100,000 people. The infantile form accounts for 90% of the cases in the northern European populations. It is also known as globoid cell leukodystrophy. Krabbe’s disease is caused by the mutation of a particular gene (GALC) that produces a specific enzyme (galactocerebrosidase). The absence of this enzyme caused by the mutation leads to the accumulation of products (the galactolipids) that will destroy the oligodendrocytes – the cells that are responsible for the formation of myelin. The subsequent loss of myelin (a phenomenon called demyelination) prevents nerve cells from sending and receiving messages. 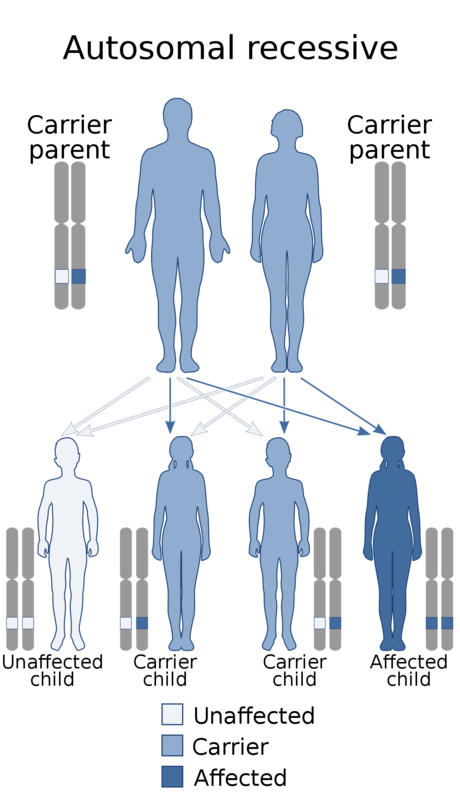 The mutation in the Krabbe disease-associated gene only causes the disease if the patient has both mutated copies of the inherited parental gene. A disease resulting from two mutated copies is called an autosomal recessive disorder. A 25% risk of inheriting two mutated copies, which would lead to the disease. A 50% risk of inheriting a single mutated copy. The child is then a carrier of the mutation but does not develop the disease. A 25% risk of inheriting two normal copies of the gene. In some cases, Krabbe’s disease is diagnosed in newborns with screening tests before the symptoms appear. However, in most cases, the onset of symptoms is triggered first before a test, followed by an exploration of possible causes. A blood sample and a biopsy (small skin sample) are sent to a laboratory to evaluate the level of activity of the GALC enzyme. A very low level or zero activity level may reflect the presence of Krabbe disease. Although the results help a doctor to diagnose, they do not provide evidence of how quickly the disease can progress. For example, a very low GALC activity does not mean that the disease will progress quickly. An abnormal EEG may reinforce the hypothesis of a disease. Magnetic resonance imaging, a technology that uses radio waves and a magnetic field to produce detailed 3-D images. Computerized tomography, a specialized radiology technology that produces two-dimensional images. The nerve conduction study, which assesses the speed at which the nerves can send a message. When the myelin around the nerves is altered, the nerve conduction is slower. A genetic test can be performed with a blood sample to confirm a diagnosis. If the parents are known carriers, they can request a prenatal genetic test to determine if their child is likely to develop the disease. If one or both parents are likely to have a GALC gene mutation because of a known family history of Krabbe’s disease. If a child is diagnosed with Krabbe disease, a family may consider genetic testing to identify their other children who might develop the disease later in life. Known carriers using in vitro fertilization may require genetic testing prior to implantation. In some states, a Krabbe disease test is part of a set of standard assessments for newborns. The initial screening test measures the activity of the GALC enzyme. If the activity of the enzyme is low, GALC follow-up tests and genetic tests are performed. The use of screening tests in newborns is relatively new. A number of complications – including infections and breathing difficulties – can develop in children with advanced Krabbe disease. In the later stages of the disease, children become disabled, stay in bed, and end up in a vegetative state. Most children who develop Krabbe’s disease in childhood die before the age of 2, most often by respiratory failure or complications related to a total loss of mobility and a marked decrease in muscle tone. Children who develop the disease later in childhood may have a slightly longer life expectancy, usually between two and seven years after diagnosis. The first signs and symptoms of Krabbe’s disease in early childhood may resemble several diseases or developmental problems. Therefore, it is important to get a quick and accurate diagnosis if your child has any signs or symptoms of the disease. The signs and symptoms most commonly associated with older children and adults are not specific to Krabbe’s disease and require timely diagnosis. What signs or symptoms did you notice? When did they start? Have you noticed any changes in your child’s attention? Did your child have a fever? Have you noticed any changes in eating habits? Has your child experienced changes in his school performance? Did you have difficulty with normal tasks or work related work? Is your child treated for any other medical problem? Has your child recently started a new treatment? In most cases, the signs and symptoms of Krabbe’s disease appear in the first few months after birth. They start gradually and progressively worse. In general, the earlier the onset of Krabbe’s disease, the faster the disease progresses. Some people diagnosed during adolescence or adulthood may have less severe symptoms, muscle weakness being a major condition. They may have no alteration of their cognitive abilities. For infants who have already developed the symptoms of Krabbe’s disease, there is currently no treatment that can alter the course of the disease. Treatment therefore focuses on symptom management and supportive care. The supply of nutrients, for example through the use of a gastric tube to provide liquids and nutrients directly into the stomach. Transplantation of hematopoietic stem cells that can maintain myelin by producing GALC enzymes. They come from umbilical cord blood, donor bone marrow or circulating blood stem cells. This therapy can improve outcomes in infants if treatment begins before the onset of symptoms, ie when a diagnosis is made after a newborn test. Infants who do not have the symptoms yet and are receiving a stem cell transplant have a slower progression of the disease. However, they still have significant difficulties with speech, walking and other motor skills. Older children and adults with mild symptoms may also benefit from this treatment.